Simply drop by our school or call for an appointment. 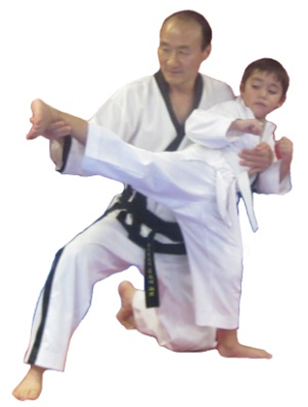 All students, unless already experienced in Taekwondo, begin with a 2 weeks beginner lessons which teaches students basic techniques, manner and terminology. We have a family classes with a great discount rate. If you or your youngster is unclear or uncertain about Tae Kwon Do, feel free to observe a class. We personally invite you here, to try our 2 weeks beginner class for you & your family “5 yrs and up”. These lessons are for you to meet the instructor & show you the benefits of learning Taekwondo. With these lessons you can find out the quality of our instruction with no obligation! The trial program gives you the chance to visit the school, you will learn at your own pace while becoming familiar with the skills you will eventually be performing in classes. Membership to Unified Tae Kwon Do is open to all individuals who want to be a part of the life-changing Tae Kwon Do experience. Our students range from 5 year-old children to adult students well in their 80′s – and everyone in between. You do not have to show up in shape for Tae Kwon Do, we’ll get you in shape. You do not have to know how to do powerful kicking techniques to start Tae Kwon Do, we’ll teach you that too. You do not have to be an Olympian either, but if that is your goal, we can help you reach it. You do have to have a desire to improve yourself both physically and mentally and be prepared to be challenged. You can join Unified Tae Kwon Do anytime students work at their own pace. You can join now! If you would like to check us out to see if our school is right for you, please be our guest to watch any of our training classes in action. Check the class schedule to find a time that offers the type of class you are interested. We have a large observation area that has a great view of the workout area, equipped with lots of seating. Students with previous Martial Arts experience and new to the area, or current students from other Martial Arts Schools looking to improve their skills (or want more intensity in their training) are welcome to be a part of Unified Tae Kwon Do. In most cases your previous training is recognized and your rank accepted from another school. However, you should talk with Grand Master Park to discuss what level you should start.